Whether you've got a single car wash or one hundred sites, your customers expect consistent quality and experience. Ensure that your customers’ expectations are being met with the first operations management software built for the car wash industry by car wash veterans. Use OPEn on your smart phone, tablet, laptop or desktop. There is no software to install. Keep track of hard-to-remember information about your car wash in one easy to find place. 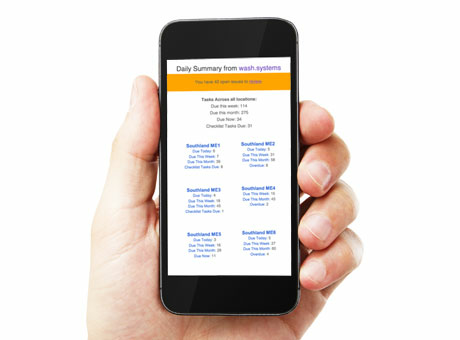 Receive a daily summary of all your open maintenance tasks, checklists and open issues. You know how important it is to provide great service for your customers. OPEn provides the framework to ensure your wash regularly delivers the highest levels of quality. Let us show you how to ensure your wash delivers time and again. No need to use a computer in the office, use whatever device is handy! OPEn site is optimized to work where you do. Need to open an issue on the go? No problem! You can even upload images using your phone's camera. OPEn keeps track of all the small things so you don't have to. Need to know when you last replaced a part? Want to see when your next compressor oil change is needed? Curious about issues your conveyor has been having? OPEn can track all of this and more. Better yet, it's all at your finger tips. No need to use a computer in the office, use whatever device is handy. We've optimized OPEn so that you can get the most out of it from anywhere. Log issues with pictures from the tunnel using your smart phone. Complete checklists from your tablet while training your newest employee. Add a new maintenance task from your laptop on your next rain day. It's all built into OPEn. “We needed a solution to track preventative maintenance. Google Docs and cloud based doc sharing was a solution but it didn’t provide the real tracking and reports we needed. Wash.Systems is improving our maintenance and issue tracking. We are resolving more things faster and with less effort. Yes, I would like a live screenshare demo! Join one of the Wash Systems team members for a brief, guided tour. Let’s talk about you, how your operation works and discuss some of your current operational challenges. We’ll see if OPEn is a good fit and outline a few benefits of making the change. We can be flexible, although a typical demo and Q&A takes 30 minutes. We'll hit you up ASAP to find a good time. Get ready for some fun!